SAN BERNARDINO, Calif., June 17, 2009 — In partnership with the Cotsen Institute of Archaeology at UCLA, the San Bernardino National Forest, will be conducting an archaeological field school in the Holcomb Valley, just north of Big Bear Lake. Students working with Forest Service archaeologists will perform archaeological survey and excavations for 5 weeks. The field school is planned for June 22 though July 24, 2009, (Monday through Friday) and will conduct National Register excavations at the 1860s mining camp of Clapboard Town, one of three mining camps once located in Holcomb Valley. 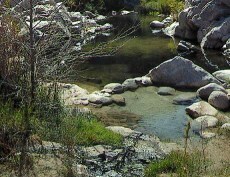 The valley is the site of the richest gold strike in Southern California history and is currently a recreation and camping destination on the San Bernardino National Forest. The excavations at Clapboard Town are located on the south side of Forest Service road 3N16, between 2N07 and 3N12. The public is welcome to view the excavation work in progress.